Traditional fully-refurbished, four bedroom house. Set in beautiful established gardens including olive trees. Outside dining area. Fantastic sea views from top terrace. Private pool, terrace areas. Mature trees provide shaded areas and also full sun round the pool, something for everyone! Four bedrooms - one en-suite with king sized bed, one double with king sized bed, one with twin beds and one with bunk beds. There are three bathrooms, (one en-suite to the top floor master bedroom, and a family bathroom on the first floor.) Three bedrooms have balconies off. On the ground floor there is a large hall with two steps down to the sitting room, a dining are leading to a brand new fully fitted kitchen with fridge freezer, high level electric oven with separate gas and electric hob and dishwasher. Patio doors lead from the kitchen to the outside dining area with table and eight chairs. The house is a short walkable distance to the sea and the local beach club where you will find a bar restaurant sun beds, and for the price of a drink, snacks or ice creams during the day. There is also a diving school offering full Padi courses plus a variety of water sports. We first came to Kalkan in 1998 and instantly fell in love. Several holidays later, we decided to take the plunge and buy our own home here. Villa Ayla has been the centre of many happy family holidays, and is now playing host to an expanding third generation! 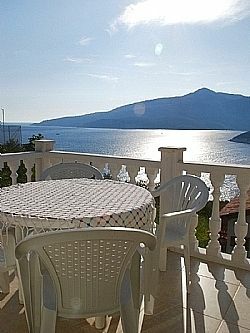 We chose this location because it combines the peace of Kalamar Bay, with easy access to Kalkan town, with all the bustle of shops, restaurants, banks and quaint houses. Right next to the house are steps leading down to the sea, where there is a diving school, offering a full range of Padi accredited courses as well as trial dives for beginners. Various water sports are available, and there is a restaurant serving lunches, snacks and evening meals. There is a taverna at the end of the road, and a small supermarket 5 minutes walk. The property benefits from being detached and standing in its own gardens, which include flowers and trees including olive trees. It has its own private pool for the exclusive use of our guests. The pool is maintained daily, and the garden has an automatic watering system. The house accommodates 6 adults and 2 children in 4 bedrooms, and there is also a cot. Right next to the house are steps leading down to the sea, which is only 5 minutes away. There are beautiful views over the bay from the upstairs balcony, the perfect place to watch the sun go down. It is a 15/20 minute walk into town, or there is a local bus (dolmus) running continuously in season or taxis which are reasonably priced and readily available. The three recently refurbished bathrooms have shower, toilet and hand washbasin. Notes on accommodation: House is suitable for children although they need to be supervised in and around the pool. The house has been extended upwards in recent years to give stunning views over Kalamar Bay. Although it sleeps 8 very comfortably in 4 bedrooms, because the original accommodation was on the ground and first floors only, it is also suitable for smaller groups or families. Outside: Surrounded by beautiful, well established gardens including olive trees. Large terrace area and private pool with two further terraces adjoining master and twin bedrooms. Two barbecues in separate barbecue area. Full range of wooden furniture including reclining chairs, wooden "steamer" style sun loungers, small tables and directors' chairs, plus and hammock. Plenty of shade provided when required by mature trees. Utility Room: Not applicable, all white goods are in the kitchen. Cleaning / Towels / Linen / Maid service: House is cleaned at the beginning and end of your stay. All linens and towels (except beach towels) are included. An extra mid stay change of bedding and towels is £50 payable with the holiday balance. The sea is five minutes walk from the villa. There you'll find a full range of water sports including scuba diving, for leisure and for Padi courses. There is also a restaurant serving drinks, light lunches and evening meals, the perfect place to watch the sun set over the bay. Various other beaches are within walking or close driving reach. The sandy beaches of Kaputas and Patara are 5mls and 12mls respectively. Both can be reached by bus or taxi if you don't have a car. Dalaman Airport is one and three quarter hours by car. Antalya Airport is three hours. Transfers can be arranged at cost, or you can hire a car for the duration of your holiday. Cars can be hired locally or from the airport and although by no means essential, can add to the enjoyment of your holiday. 1 mile from Kalkan 3 miles from Islamlar 5 miles to Kaputas 12 miles from Patara beach and ancient heritage site. Kalkan is well served with shops, banks, traditional and modern cafes and restaurants, many perched on rooftops overlooking the mosque and harbour. Places of interest are numerous and include many ancient sites such as Xanthos and Patara, the latter being the entrance to a beautiful 12 mile long sandy beach. Both available by local bus, taxi or car. Inland are many traditional villages and the Taurus Mountains provide spectacular scenery and opportunities for keen walkers. Kalamar and Kalkan are situated on the 500km Lycian Way, a footpath which goes from Fethiye to Olympus and which can be walked in whole or part stretches. (Guide book and maps in the house). Booking Notes: 25% non-refundable deposit is required at the time of booking. Full balance being due 8 weeks before the start of your holiday, together with a damage deposit cheque of £100, returned to you within 2 weeks of you returning from your holiday providing that there is no major damage or breakages. Payment in full at time of booking if departure is within less than 8 weeks. Changeover Day: Changeover day is usually Saturday but we can be flexible depending on confirmed bookings and flight dates/times. We do our best to accommodate our guests personal requirements, but do require anything up to 6 hours cleaning time between guests.